The Hex Louver.- or the "Secret Sunshade"
One of the main problems FT shooters face is that they shoot outdoors, at all times of day, and often at strange angles. Within this set of constraints, the FT shooter often has to aim his scope high into hills or trees and risk getting his reticle "washed out" by sunlight entering his objective lens. The common solution is the well known sun-shade. Offered in almost all sizes, lengths, and colors, the sunshades are an important part of every serious scope manufacturer's offerings. But not everyone likes them. Spring-piston shooters sometimes have to cut their sunshades to make sure that the actions of their guns allow loading. Or they need to use mounts that are way too high to be stable from the shoulder. So, how to make a "compact" sunshade? One that can fit INSIDE the scope covers? That is unobtrusive, yet effective? A common technique used in the lighting industry to cut glare is to use a hex louver. A Hex Louver is a honeycomb shaped arrangement of thin (REALLY thin) metal sheets made by welding spots and then pulling the piece apart. If you start with a thin enough sheet of aluminum, the resulting arrangement is a hexagonal shaped/honeycomb shaped piece with a lot more hollows than solids. Depending on the size of the cell, and the depth of the cell, each cell acts like a miniature sunshade and, collectively, they act to cut off stray light, either entering the scope, or being reflected by the objective. If you're familiar with optics, think of it as the "fresnel" version of the sunshade. The main use of these has, up to this point, been what in military circles is called a "Kill-Flash", meaning that the main function is to reduce the amount of light that the large objective lens of a scope might reflect BACK in the general direction of shooting, so that the "target" might become aware of the presence of a scoped rifle in the vicinity. But an ARLD (the "technical" name for a Kill Flash standing for Anti-Reflected Light Device) does not need to be too deep. It only needs a cutoff angle of about 40 to 45 degrees. Therefore, as sunshades they are somewhat lacking for what us, airgunners need. Some years ago, based on our experience as lighting designers, we came up with a basic spec that we "marketed" to different suppliers of lighting equipment, and from these, we chose the one that gave us the best quality (thinness of material, coating characteristics, depth of cell and circumscribed diameter of cell). We therefore achieved a 15 degree cut-off, which was quite good. 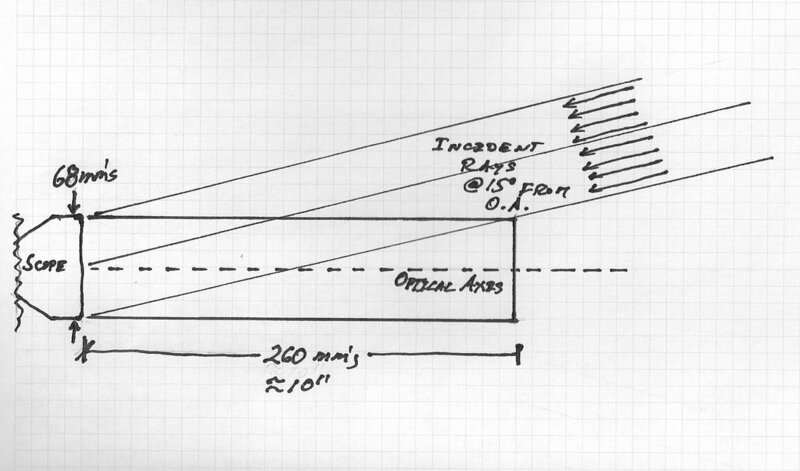 For a 68 mm's scope (most 60 mm's objectives), the length of the sunshade that would give you the same cutoff angle is about 10". Being somewhat conservative, we always say that our louvers will give you the same protection from the sun as an 8" sunshade. Now, a few "ignorami" have claimed that the thickness of the louver's "leaves", when added, reduces the size of the aperture. And that is, quite possible when the louver is "3D printed" or moulded out of plastic. There is simply no way to attain very thin sections using those manufacturing methods. But the lighting industry has a long history of making hex louvers out of "expanded metal", as outlined above. So, how thin is "thin"? Well, let me tell you that we start with a sheet of aluminum that is about as thick as aluminum kitchen foil (0.0015"). Of course the aluminum alloy is different. The cells are 1/8" x 1/4"in depth, and the results are quite good. We have never experienced a "wash-out" in our glass-etched reticle scopes, even when looking in directions that make the same scopes completely "blizzard blind" when not equipped with any protection. If you add up all the "walls" in the louver (21 to 22 depending on the size of the louver) , it barely amounts to an occlusion of 0.033" out of 2.677" it means about 1.2% So that your 60 mm's objective lens scope is ranging as a 59.2 mm's objective scope. To be quite frank, you loose more using some of the scope covers now in use. 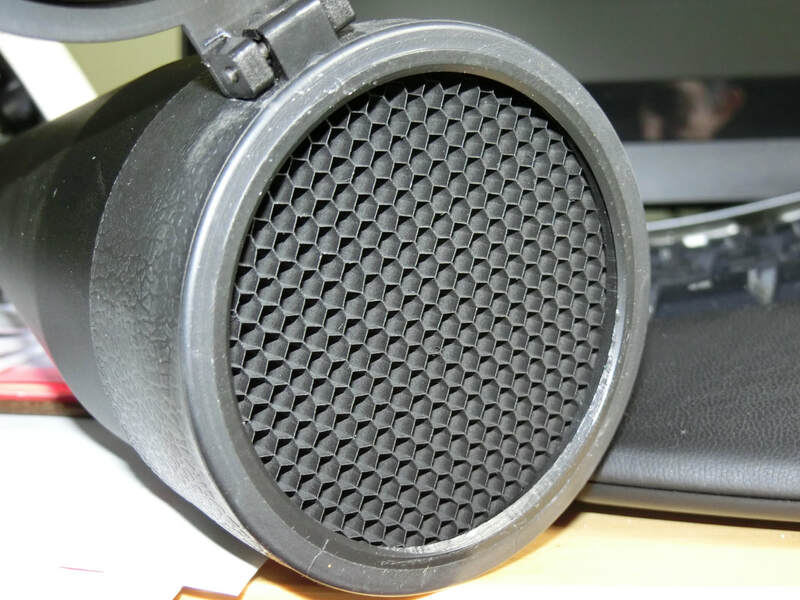 Hex Louvers are available for all scopes with INSIDE scope cover diameters of 68 mm's or less. Flip-up covers for SIGHTRON can be supplied, for all other scopes, we would need to see if Butler Creek or some other manufacturer makes proper flip-ups. In practice, the Hex Louver is cut from the 68 mm's basic "wafer" to whatever dimension the customer needs. ​Price is US$30 or equivalent at the time in other currencies. Thanks for reading and thanks for your interest in Connecticut Custom Airguns!